Jeddah: Shapoorji Pallonji (SP) International Property Developers, constituting a significant segment of one of India’s oldest business conglomerates, is making an entry in the region as property developers and adding value to Dubai’s construction market, which is set to increase to Dh181 billion next year from about Dh162bn this year ahead of Expo 2020. Today, SP International Property Developers announced the showcase of Imperial Avenue at Cityscape Global, its first real estate project outside India. An exclusive collection of luxury homes in Downtown Dubai, the 45-storey residential tower with 424 apartments and 5 levels of parking emphasizes on larger living spaces offering a high quality life. Complete with three podium levels and state-of-the-art facilities, Imperial Avenue will consist of 1, 2, 3 and 4 bedroom apartments, 4 and 5 bedroom penthouses, 3 bedroom villas and 4 and 5 bedroom villas with private pools at the podium level. With modular kitchens, designer bathrooms and private decks, every apartment will be exclusive. The tower will also consist of a 10,000 sq. ft. lobby, rooftop infinity pool, fitness center and squash courts, kids play area, private AV room and private function hall. With a strong background in engineering and as contractors for some of the top property developers in the region, Shapoorji Pallonji has over 45 years of experience in completing and delivering quality projects in the Middle East, which includes key projects such as Rove Hotels, Mudon Villas, and more. SP International Property Developers has long-term development plans to support the region in its vision to becoming a global investment destination, which includes new projects in countries such as UAE, Saudi Arabia and Kuwait. According to Deloitte’s ‘Construction Pulse – Dubai 2016’ report, the value of Dubai’s construction projects in execution and planning stages is expected to reach a record high USD 390.7bn this year with 13.7% of this (USD 53.5bn) being projects under progress. As the first Indian construction company to venture into the Middle East having been contracted to build the Royal Palace for the Sultan of Oman in 1971, Shapoorji Pallonji today has presence in over 45 countries globally, which includes 20 countries across Middle East and Africa. For more information, visit Shapoorji Pallonji at Cityscape Global in Dubai World Trade Centre at Hall No. 2, Stall No. 2E – 22. With a workforce of over 35,000 employees and presence in 45 countries globally, Shapoorji Pallonji (SP) International Property Developers constitutes a significant segment of the Shapoorji Pallonji Group. The company which is headquartered in Mumbai, India has completed key projects in the region including the Nad Al Sheba Bridge, Golf Villas for Emaar, Dubai Park Towers for DAMAC, Fairmont Bab Al Bahr Abu Dhabi and Barwa City Qatar. Currently, the company is contracted to complete Rove Hotels for Emaar, Landmark headquarters, Bloom Abu Dhabi and Mudon Villas Dubai. 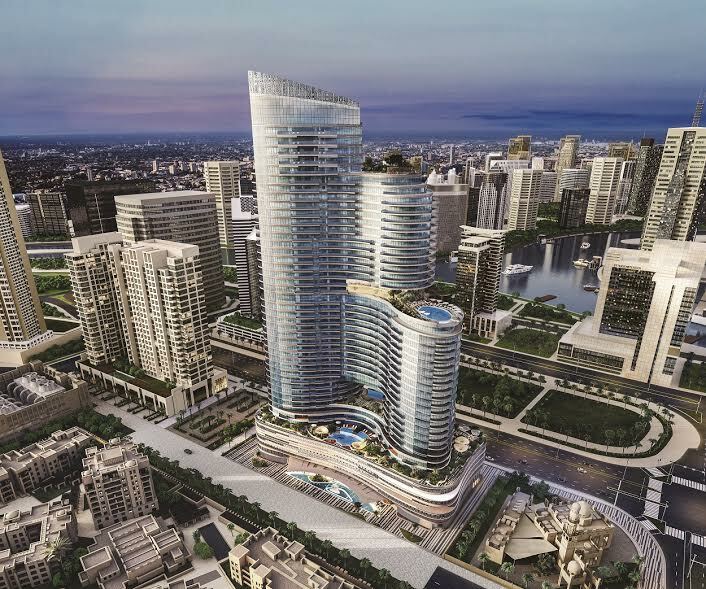 Committed to building a long-term relationship with the Middle East and Africa, Shapoorji Pallonji’s first real estate project outside India, Imperial Avenue, is currently being constructed in Dubai, United Arab Emirates. Shapoorji Pallonji is one of India’s oldest business conglomerates with a rich legacy of more than 150 years constructing world-renowned landmarks including the tallest residential building in India, the largest mall in India, the largest cement clinker plant in Asia, nuclear research establishments, airports, factories, stadiums and more. In 1971, Shapoorji Pallonji became the first Indian construction company to venture into the Middle East, when they were chosen to build the ‘Royal Palace for the Sultan of Oman’. Today, they are present in over 45 countries globally. From a small company in 1865 to a conglomerate in the present day, Shapoorji Pallonji Group of Companies has subsidiaries in construction, real estate, textiles, engineering goods, home appliances, shipping, publications, power, and biotechnology.